Which piece of armour would compliment the kit best? Well you may have seen my pics on the kit and harness thread. 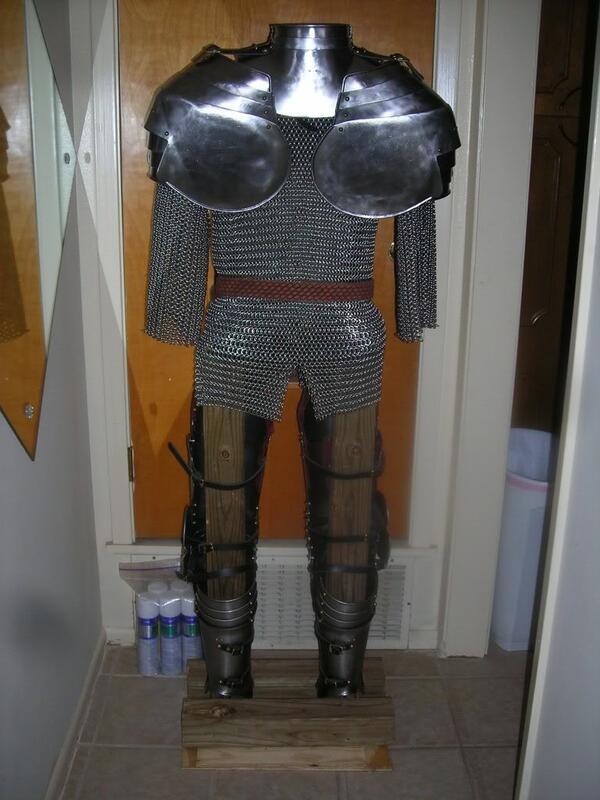 Though I am considering the next piece of armour I should purchase. I am most likely going to purchase the helm next... however my most favorite piece would have to be the gauntlets they just look awsome. 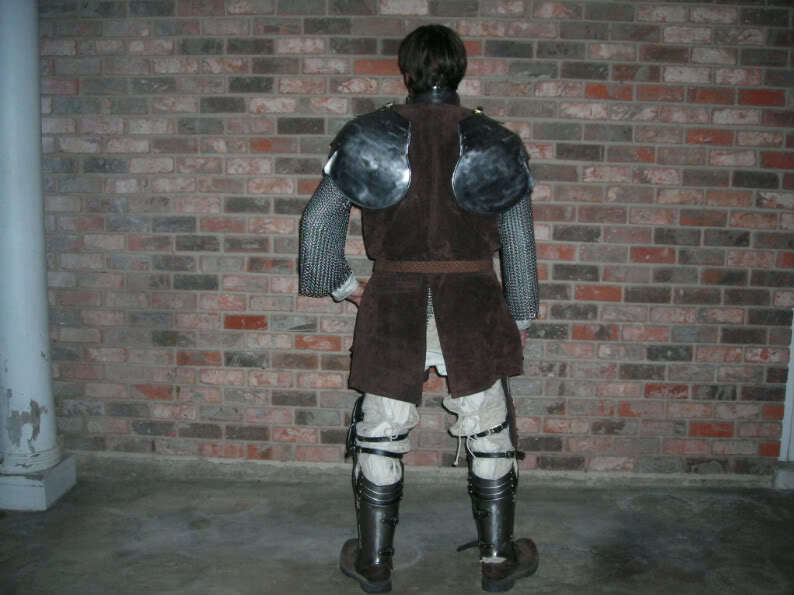 There is also the breast and back plates.... and then there is the shield. Perhaps I could gather from everyone's opinion. Here is my perspective on the matter.. Every piece of armour I purchase, I would like to be clad in armour head to toe. So each new piece would be more distinct (Of course any plate is going to be) Even though I really really desire the gauntlets... I feel that the helm is going to give a larger and more impressive touch to the full kit. but, then again the breast and back plates would look "Oh to Sweet" however I already have chain maille... Here is the pics and what would you think would be the next best purchase and why? Thank you very much for your assistance and consideration! Helmet is probably one of the most important parts of armor if not the most important one. I would say that you either need a tabard for over the chainmaille (in which case I would say that you should get the helmet), or I would get the breast and back plate. Good luck with your decision! I'm in the same boat right now with my kit. Tailoring your haubergeon (a poorly fitted haubergeon will bunch under your breastplate, plus tailoring might make it a bit lighter). In fact, considering the era you are shooting for, maille voiders might be more appropriate than a haubergeon, plus be much lighter. You shouldn't need a shield. I basically agree with the above but see how the breast plate works before doing any tailoring of the maille: It might just work as is and unless you know what you are doing and have made maille yourself tailoring might be difficult or tedious. Oh, more so if it's riveted maille. The tabard can be a temporary fix sort of hiding the fact that you don't have a breast plate, at least for looks. 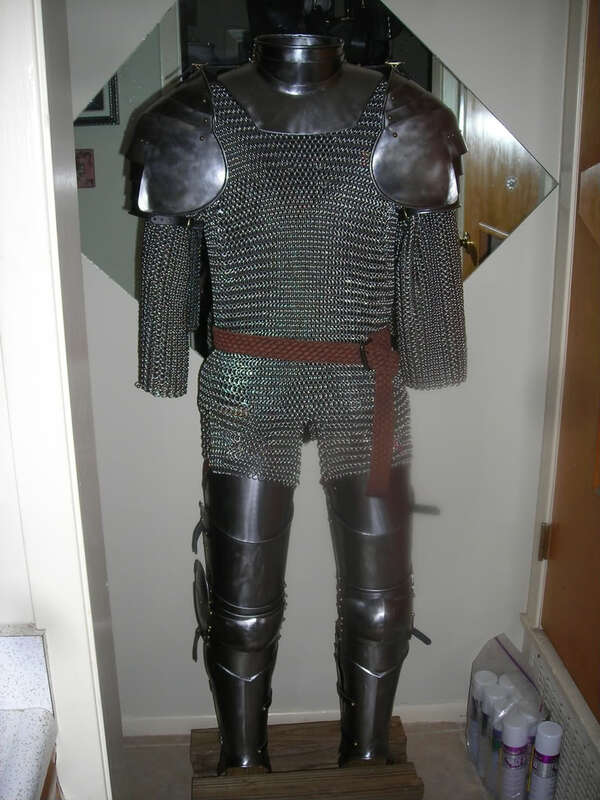 Voiders are a great idea as an alternate or supplementary piece of kit but the full maille shirt is useful when arming down for a situation where wearing the full armour might not be needed for a " Cheveauché " or travelling. 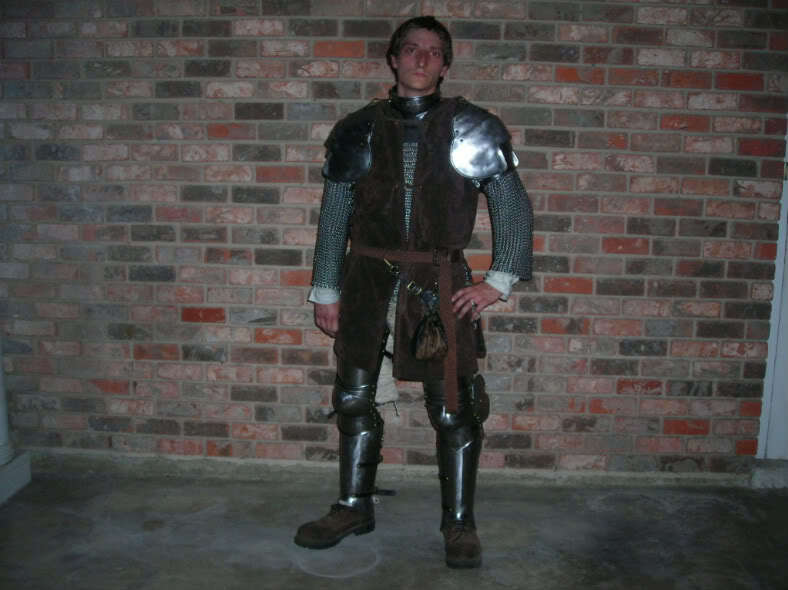 If fighting " lighter " and partially armoured for skirmishing with only helm, maille and maybe the breast plate, the shield in this case more like a rondache becomes useful. 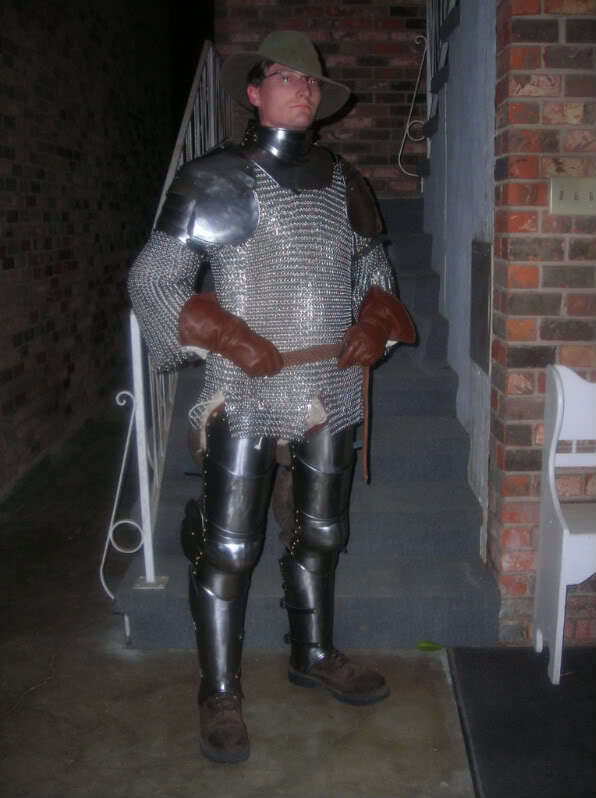 When in full armour the shield just makes it difficult to use a twohanded weapon like a poleaxe and is not needed considering that most of the body is protected by the armour. I do have a leather piece for the tabard that might work, old pic but the piece is still in good condition. I did construct the maille from the bare wire into the haubergeon. As for tailoring the maille. After I made my gambeson, I did have to re-tailor the entire haubergeon (Lesson learned) The only part on the haubergeon that is not tailored is down towards the wrist, and that is for the reason that I have not made padded arms to attach to the Gambeson just yet and I want to leave room as there might be a good fit. Posted: Mon 23 Mar, 2009 12:55 pm Post subject: Priority: Combat-Readiness or Period Accuracy? I'm no expert, but it seems to me that if you're going for "combat-readiness" you need a helmet (and cover the haubergeon with a tabard as suggested to fake period accuracy), and if you're going for "period accuracy" you should get the breast+backplate first because your pauldrons and gorget seem to clash with the haubergeon (and you can pretend that you have put your helmet aside temporarily). Since I believe I've seen you state previously that you prioritize combat-readiness over period accuracy, I'd go with the helmet (and tabard for appearences' sake). I repeat though that I am no authority on either subject. I personally think that you should get period footwear; that way you have a complete kit to walk around in, and you can always add onto that with other pieces. If you are not interested in period footwear, I would get a helmet next if this is for show, because you already have leather gloves which can pass until you can get gauntlets for them. If you do more WMA, gauntlets might not be such a bad idea next, since more hand protection is good. Tough call Chris! Since you have the maille I'd go for the helm and gauntlets first. Especially if you are looking to fight in it. If you are not looking to fight in any tournaments or clubs right away and just want it for display and to put on and play around with for now until you get the harness finished, I'd go for the Breast and Back plates. Definately do the cuirass next., the gauntlets, then lastly helmet. well not doing in fighting in it just yet. I would like to take real sword fighting in it one day, but not any time soon. 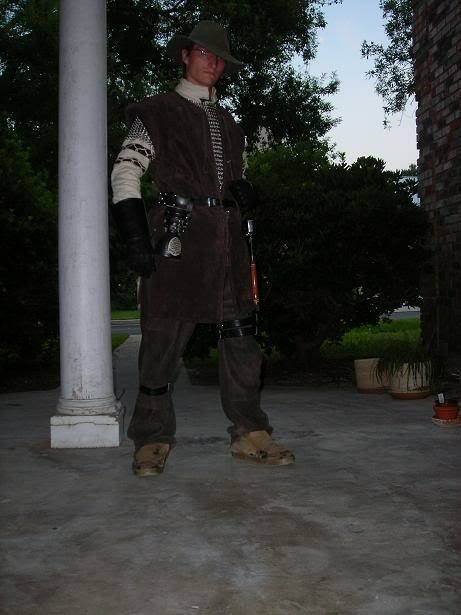 I am just wearing it around my neighbor hood and ren faires... So far with the good info and feed back over the poles I am now leaning a bit more towards the breast and back plates.... But that could always change thanks for the suggestions and info so far everyone. more opinions are always welcome. wrong type of gaunts for your suit. You'll want mittens. Well, it was a toss up on whether to do the breastplate or maille tailoring first. Most "off the shelf" harbergeons are not well fitted and I assumed Chris bought his, but since he made it himself, tailoring should be moot. Thank you for all of the votes and the replies. I was decided on the helm, however after taking into account the afore mentioned... I will be going with the Breast and Back plates, faulds w/ three piece tassets & Gussets. The information provided helped me make a round decision. Just as a side note, once I acquire the next pieces to buy. 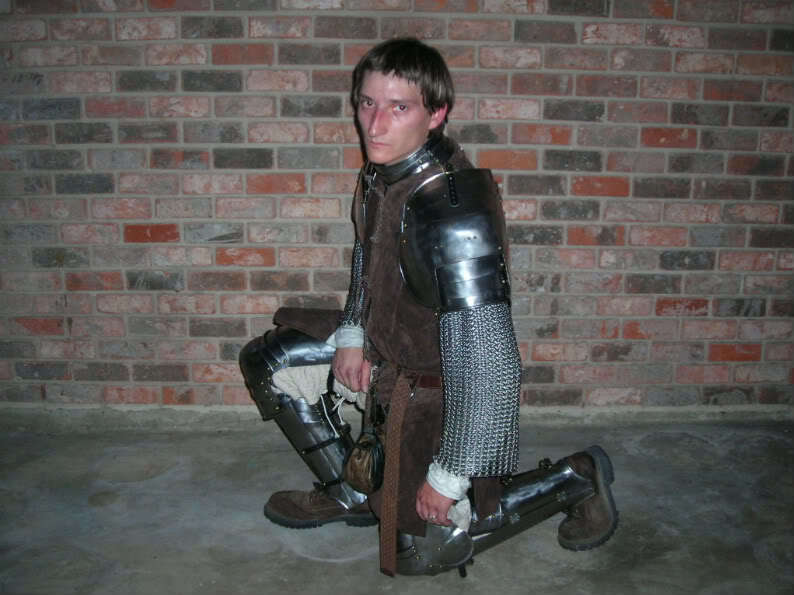 I will take apart my maille to make voiders and then to make voiders for my legs as well. That way I save on money but can distribute the maille to all the places that I need it. I took a few pics with my surcoat to show what I have for now... And again Thank you all a ton for the votes and input. are you going for a plakard eventually? or are you just going to go with a B+B?